Aaron and Melissa Allen always dreamt of opening up a brewery. Aaron, a Chemical Engineer and avid home brewer, Melissa, with a love of customer service, always dreamed they would open up a brewery in their retiring years. Completing her MBA, Melissa developed a set of contacts that enabled her to shorten the timeline, bringing their dream to a closer reality. Aaron and Melissa made their dream come true with the brewery opening with a New Year’s Eve launch party in 2014! Seven Arrows Brewing Company’s name was inspired by a Native American blessing. It references the creator, the earth, the four directions, and back to the creator. It all comes together with the logo of the compass rose signifying the four directions and the four main ingredients of beer. Seven Arrows Brewing Company’s hope is to provide high quality craft brewed beers to the Shenandoah Valley. Drawing on the experience and capability of the head brewer, Seven Arrows intends to provide consumers with quality products and a relaxed environment in which they can be enjoyed. Outside the world of brewing both Melissa and Aaron are extremely active. Melissa has completed 17 marathons and one ultra-marathon, with countless other races in between. Similarly Aaron has completed over 20 marathons, an ultra-marathon and currently just completed his 5th Ironman triathlon. To uphold superb quality at all levels of production and satisfying all our customers. Stay aware of the impact of taste, look, and feel of a good beer as well as its costs impact to the market. Provide value to our customers who are concerned about a quality product that is offered at a reasonable price. 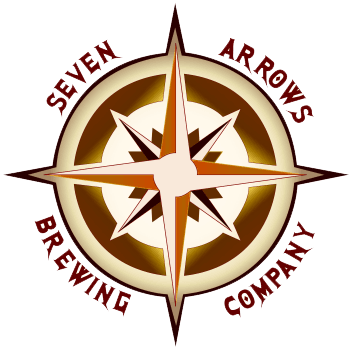 Seven Arrows Brewing Company intends to create a relaxed, social and enjoyable environment that provides high quality and true to style beers.